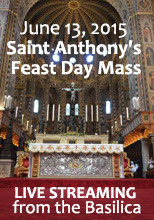 On June 13th., 2015, Saint Anthony's Feast Day, the solemn Masses will be streamed live from the High Altar of the Basilica at 10:00 AM, 11:00 AM and 5:00 PM (CET). 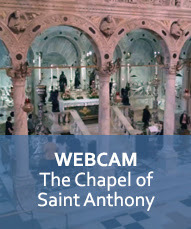 From May 31st., 2015, the start of the 13-Day-Novena to St. Anthony, you will find a great novelty at the Basilica: a webcam which will film the area around the Tomb of St. Anthony every day for the whole day. The video camera which films the area around the Main Altar will, in any case, remain active. This video camera is already streaming the Masses during important feast days.